Unable to match the Honor's level of customizations, the Huawei Vision settles for a ready-made solution. 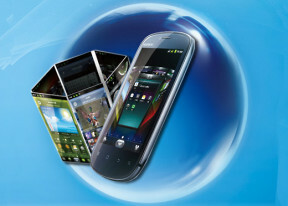 The preloaded SPB Shell 3D launcher is the only major add-on to what's mostly stock Android. You naturally have plenty of other custom launchers to choose from but there's the SPB Shell 3D . Here's a user interface demo video to get things started. The SPB Shell 3D offers a fluid and very customizable UI experience with up to 11 different screens. You can set any of them to be the main homescreen. The custom launcher comes with its own custom widgets to go with the standard Android set. Placing items on the homescreen is simple to do and the custom SPB widgets do live up to their 3D name in the visually rich and smoothly animated interface. The so-called Carousel is an overview of all available homescreen panes. A dedicated button placed at the bottom of the screen launches the Carousel preview and lets you switch between screens, rearrange them, set different background colors, rename or get rid of the unneeded ones. The notification area really feels like pulling the blind - so stark is the contrast between stock Android and the rich visuals of the custom launcher. You get all current connections and new notifications displayed but there're no quick toggles for Wi-Fi, screen rotation, Bluetooth, etc. The lockscreen on the Vision is standard Android too. A swipe to the right unlocks the phone while swiping in the opposite direction toggles silent mode. The app drawer is a vertically scrollable grid. You can't reorder icons, which are sorted alphabetically. It's not the best way if you're used to seeing your latest downloads at the top or bottom. All apps that have had their shortcuts pinned to any of the homescreen panes are marked with a small Home icon. The SPB Shell 3D launcher offers options for the background color of your screens, along with other visual tweaks, including a stereoscopic mode, which is utterly useless. All in all it's a nice custom launcher with plenty of options and full of eye candy. What we didn't like about it is that it tends to feel cramped on a smaller screen. Homescreens appear crowded and can be disorientating. The good thing is the custom SPB Shell launcher doesn't slow things down, not a bit. The Huawei Vision is not the fastest piece of smartphone to begin with, running a single-core 1 GHz Snapdragon CPU with Adreno 205 and 512 MB RAM. This is duly reflected in its benchmark scores, but the important thing is we didn't experience any frustrating lags.